A left-wing group recently put out a report criticizing low-tax jurisdictions for attracting capital and investment from high-tax nations. And here’s some of what CNBC reported. The problem, says Dan Mitchell, a senior fellow at the Cato Institute, is that the estimate is based on a series of assumptions aimed at making people “believe that much of cross-border investing is all about tax evasion and that all this money should go to government, and that this would be a good thing.” The real problem facing governments, Mitchell says, is spending not revenues. I also was part of this CNN report. A few things about this interview are worth highlighting. 1. First, it’s a bit disappointing that CNN even bothered to cover this non-story. This is akin to me pulling numbers out of the air, claiming that tax reform cures cancer, and then having Fox News report my make-believe nonsense simply because some of the programming is conservative. It’s also rather revealing that they referred to the Tax Justice Network merely as an “advocacy group” rather than revealing that they have a hard-left orientation. I don’t object to Cato being identified as “libertarian-leaning,” but why not also let viewers know that the cranks at TJN also have a point of view? This is a remarkably radical and misguided assertion, as you can see from this chart. Henry is basically saying that money should be diverted from private capital markets, where it funds wage-boosting investment, in order to facilitate higher spending by politicians who already have spent their nations into fiscal crisis. 3. Even though I wasn’t given credit for the comment, I’m glad that the reporter (at the 2:38 mark) noted my argument that the real problem is that many nations have class-warfare tax systems that penalize work, saving, and investment. This is why, when I give speeches in the so-called tax havens, I frequently say that they should be worried about “onshore” nations adopting the flat tax. Sadly, there’s no short-run possibility of replacing the corrupt tax system in America, so places like Singapore, Switzerland, and the Cayman Islands don’t have to worry about competitive pressure from the United States. The main thing to understand about this “tax haven” debate is that groups like the Tax Justice Network are closely allied with governments in left-wing nations such as France, and they share the same goals as statist international bureaucracies such as the Paris-based Organization for Economic Cooperation and Development. If they succeed in crippling tax competition and setting up some sort of global network of tax police, more politicians will raise tax rates, causing more misery, and bringing more nations one step closer to Greek-style fiscal collapse. P.S. The TJN report isn’t total nonsense. The author correctly recognizes, for instance, that the United States is a so-called tax haven. Where we disagree is that Mr. Henry wants American lawmakers to deliberately make the United States less attractive to international investors and I think it is a gross mistake to enact policies that will hurt American workers by driving capital out of the economy. 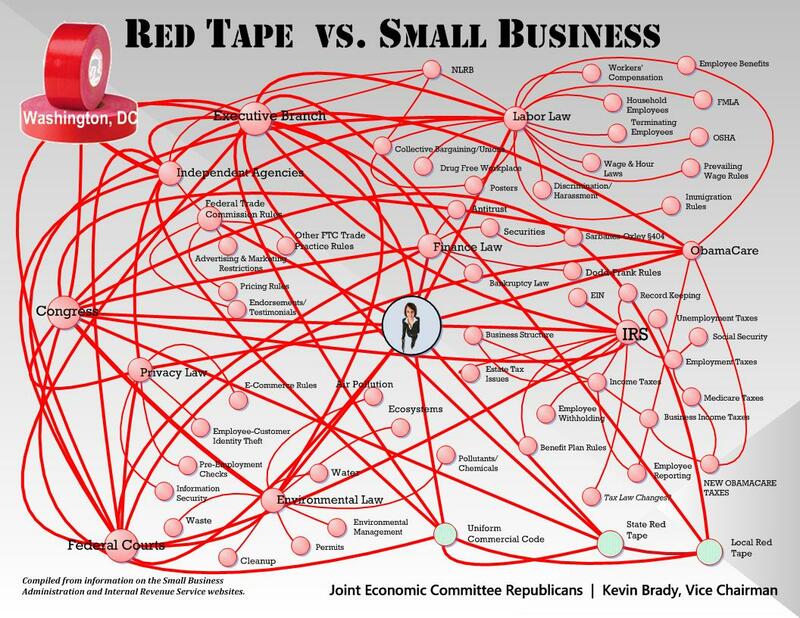 This chart does more than just show sources of red tape coming from Washington. It shows that “Washington” is really several entities, such as Congress, the executive branch, the courts, and so-called regulatory agencies. These varies entities then impose regulatory burdens in various fields, such as labor, finance, tax, and environment. Keep in mind, by the way, that each small pink circle actually represents an entire field of regulation. 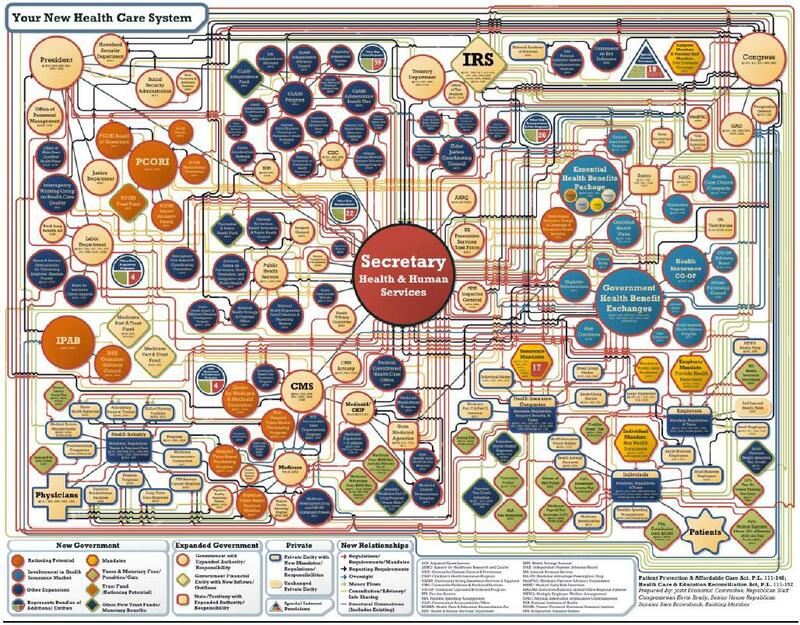 So when you see, for instance, the “Obamacare” circle, what you’re really seeing is this nightmarish image of regulatory complexity. And don’t forget the role of state and local government. Last but not least, remember that each regulatory bureaucracy is then capable of making individual decisions that…well, you judge for yourself. Gee, it’s almost enough to make you think regulation might be the problem and not the solution.